Store and display your Cuisinart® cookware within easy reach. The cookware racks are simple to install and designed to last a lifetime. Twelve models guarantee the right fit for any kitchen and any size cookware colletction. The Half Circle Wall Rack-Oil Rub Bronze Chef Classic Cookware Rack has many exciting features for users of all types. 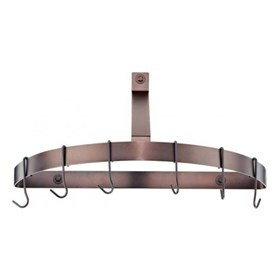 See the Half Circle Wall Rack-Oil Rub Bronze Chef Classic Cookware Rack gallery images above for more product views. The Half Circle Wall Rack-Oil Rub Bronze Chef Classic Cookware Rack is sold as a Brand New Unopened Item.